So how’s this for a movie premise? A man acc used of sexual assault is sent by the government on a mission to rescue abducted women in exchange for his freedom. Fairly sensible, right? Sounds like an innocuous action feature that could have thoughtful moments if the irony is properly addressed and incorporated into the story arc. Sorry, but that’s not the movie being reviewed today. Here’s the real story: Not one, but two nuclear holocausts have befallen Earth, leaving the land barren and the people infertile. But when a man named Sam Hell (played by pro wrestler “Rowdy” Roddy Piper) is taken into government custody for sexual assault, tests reveal that his sperm count is especially high. This discovery gives the government an idea: send Sam Hell into the wastelands that have been overrun by mutant frog-people to rescue the five women abducted by Commander Toty, the king of the frog-people (Get it? Toty? Like Toadie? See what they did there?). Forcibly accompanied by a doe-eyed, leggy blond nurse and their femme fatale driver/gunner, Sam Hell heads into Frogtown to break up Commander Toty’s harem so that he can impregnate the women and save mankind. Only when Sam Hell accomplishes this mission will the sexual assault charges be dropped. To answer your questions: Yes, this is a real movie. It happened. People created this. And no, it isn’t X-rated, although it should have been. As it stands, the only value it has is as fodder for a jackass’s review of it 23 years later. Alas, I won’t review this movie in the classic sense. You’ve just read the synopsis and it is clear that a story like this reviews itself. 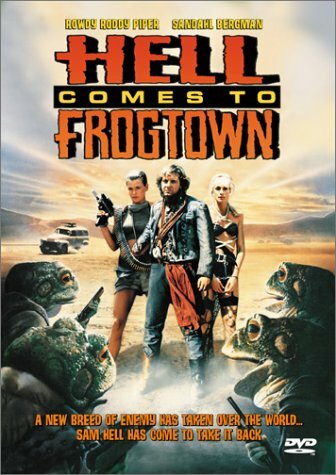 But, in short, “Hell Comes to Frogtown” is terrible and weird; don’t see it. Seriously. I just discovered that this triumph of cinema spawned three sequels. I’m going to come back up so we can watch all of them. But first, I’M GOING TO GET MORE GAS! !